LotBraining is a personal development iPhone app geared to help users with mental health. As people, we could probably stand for a bit of improvement. Attitude, outlook, personal hygiene. There’s always some aspect of our lives that can be polished up. But what they say is true: change comes from within. With that in mind, if you’re really set on bettering yourself, you should try LotBraining. 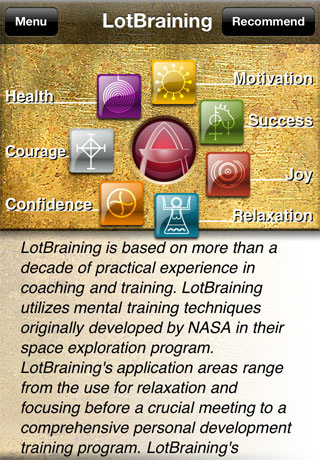 Originally developed by NASA in their space exploration program, LotBraining uses mental training techniques to provide mental support in both ordinary and unprecedented situations. Upon launch, there are seven modules representing different areas in which you can train your focus: health, motivation, success, joy, relaxation, confidence, and courage. 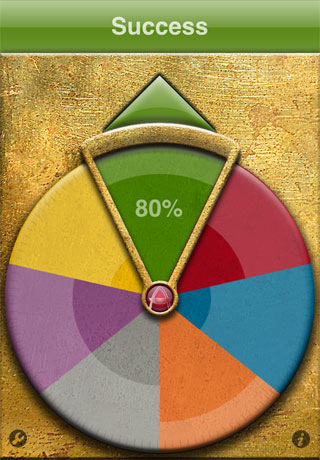 Spin the wheel to choose one, then tap the arrow on top to either Test or Train. All Tests consist of three questions that are geared towards evaluating their respective aspects. The end results come out as a percentage and some helpful hints, so you’ll know which areas to work on. You can repeat the test if you think it was faulty the first time around, but you should probably start working on your weakest areas in Training first. Before going through any of the Training, you should adjust the training intervals in Settings. That way, you can mold the program to accommodate your schedule. There is also a Reminder service that will prompt you to initiate a Training session. To me, Training is most analogous to meditation: you fix your thoughts according to area, relax your body, focus your eyes on the pulsing symbol, and breathe for the entire Training period. Confidence, for example, calls for thoughts of a situation in which you are needing confidence. For all areas, there is a Notes section where you can jot down situations or thoughts that you can concentrate on, for easy retrieval. Repeat this process for any area, and soon you may begin to see results in your life. LotBraining is an app that exemplifies a “positive thinking begets positive reactions” sort of attitude – as such, your mileage may very much vary. This is the type of exercise that requires at least a little bit of faith prior to beginning them, so if meditation and positive thinking aren’t your thing, it may take a few more sessions of LotBraining before satisfaction. I do wish that the Test results were based on more than three questions, however; you can’t seriously judge a person accurately on only three questions, right? LotBraining is a breeze to navigate with an interesting emphasis on colors and symbols to guide you. I really thought it’d be more complicated, seeing as the app costs 10 dollars. I’d really like to know how they came up with those. Meditation and reflection never hurt anybody, but if you aren’t serious about trying these exercises out to improve your life and “streamline your mental processes,” you should probably spend your money elsewhere. AppSafari review of LotBraining Mental Training for Personal Development was written by Julie Guan on March 24th, 2011 and categorized under App Store, Education, Health, Utilities. Page viewed 4855 times, 1 so far today. Need help on using these apps? Please read the Help Page.